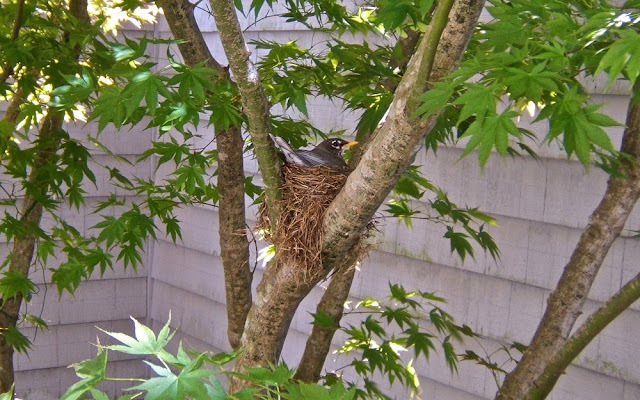 We had been watching a male robin and this nest being built in the tree that's growing in our inner courtyard. It's reported that it's the female who constructs the nest, but we only saw Mr. Robin flitting around while it was taking shape. The canopy of that Maple tree is right off our upper deck which is home to many metal sculptured birds. These may look familiar, but different from ones you've seen for sale. We've had them for quite a few years and they've been repainted a couple of times. Finally we saw Mrs. Robin. She has been sitting on the nest for a bit more than a week. It will be interesting to watch the fledglings when they hatch. 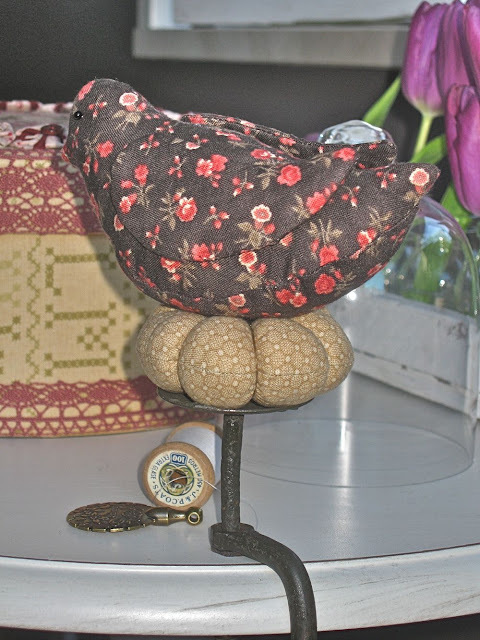 There's been a lot of activity on my bird pattern site, as well. Carmen from the Netherlands crafted this bird pincushion. I love that nest ... or are those eggs. It's not only functional, but a wonderful solution if someone doesn't have suitable wire for the bird's legs. 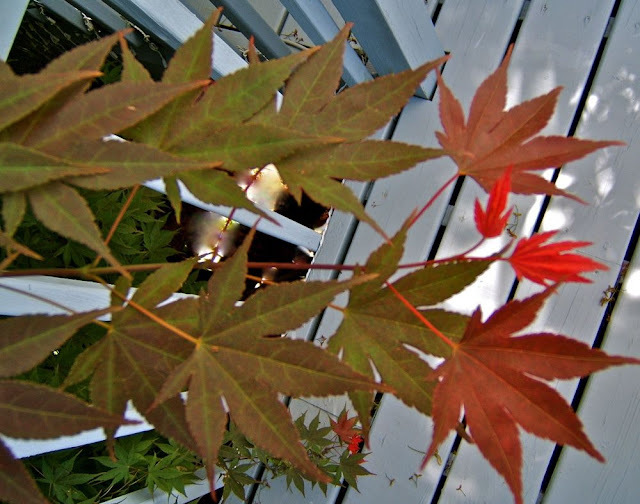 While I had my camera out on the deck I took a photo of the bright red new growth at the ends of the branches on the Maple tree. i used to have some of those metal birds in my arizona dessert scape. we called them 'goonie birds'. guy sold them down the street....loved em. Wonderful photos and wonderful birds!! Mrs. Robin looks very content. Carmen did a great job with her bird and eggs! I've had to change my blog url- long story- I'll let you know when it's up. 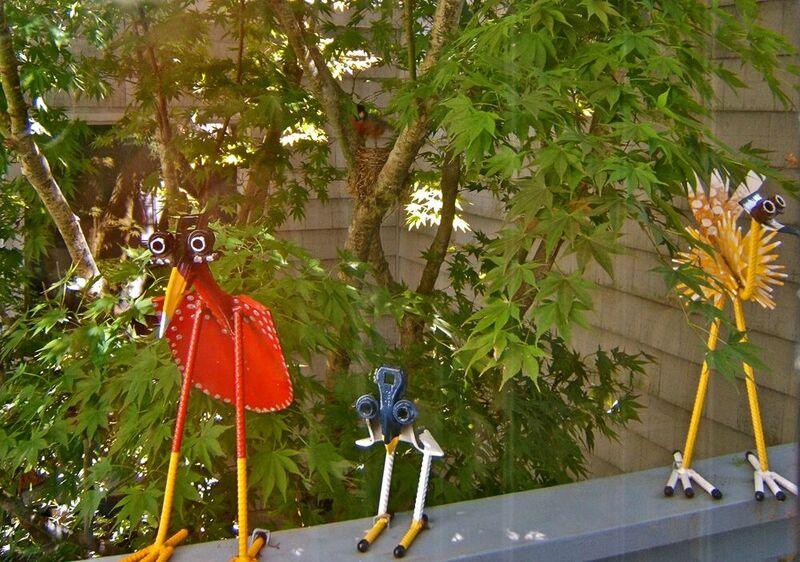 I love the birds Nellie, whether they are metal, feathery or fabric. Your robins are very different from ours here in the UK but it is lovely to have nests in the garden. The photo of foliage is beautiful. thanks for sharing the photos of nest and birds. You certainly have a front row seat to that nest. I miss my maple trees! I made the mistake of bringing a potted one with me; the desert didn't treat it kindly.